12 signs it’s time to get out of Gaza: Operation Protective Edge needs to end. Operation Protective Edge needs to end. 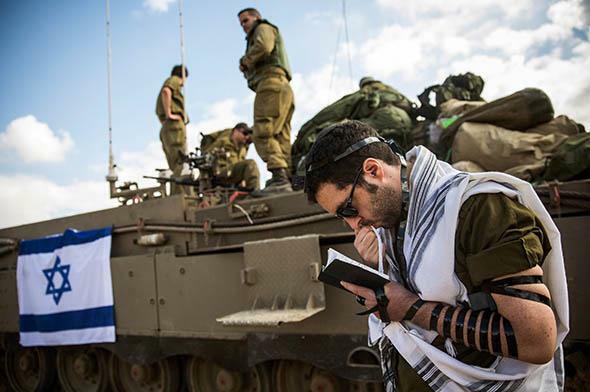 An Israeli reservist soldier prays near the Israel-Gaza border on July 18, 2014, near Sderot, Israel. 1. Your enemy refuses to protect its people. Normally, if you invade a country and pound the daylights out of it, you can expect its government to seek, or at least accept, a cease-fire to stop the bleeding. Not here. Hamas has refused to endorse or honor a simple cease-fire despite the ridiculous imbalance of casualties. Israel argues, correctly, that Hamas doesn’t care about Gazan civilians. Hamas also seems fragmented, unable to make decisions. Arab governments aren’t stepping in, either—they seem to hate Hamas more than they love Gazans. But the absence of competent advocacy for Gazans isn’t a reason to keep shooting. It’s a reason to stop. When your enemy shows no mercy for its own people, that responsibility falls to you. 2. You’re killing too many civilians. Last time I checked, on a per-strike basis, Israel’s rate of inflicting civilian casualties was lower than NATO’s in the Kosovo war. But in just three weeks, Israel has launched so many strikes that its civilian casualty toll has eclipsed NATO’s. 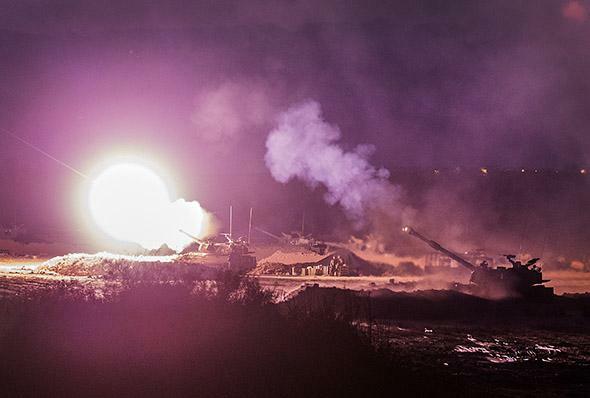 An Israeli artillery gun fires a 155-mm shell toward targets in the Gaza Strip near Israel’s border on July 30, 2014. 3. Your civilian protection measures are failing. I’ve praised the IDF for its exemplary double-layered warning system: phone calls to residents of buildings, followed by dummy bombs designed to scare people out of the building before the real strike hits. The IDF has also robo-called and leafleted neighborhoods, warning people to clear out before the area is invaded. But these measures are failing. Some people never got phone calls. Others misunderstood the dummy bombs and went back into their houses, thinking the strike was over. Some stayed in targeted neighborhoods, afraid to move. Others moved only to end up in places they mistakenly thought were safe. The further the IDF advances into overpopulated Gaza, the harder it is for civilians to find a refuge. At some point, you have to acknowledge that your worthy efforts aren’t enough. 4. Your mission and methods keep expanding. First the IDF was just going to hit Gaza from the air. Then it went in on the ground, but Israel assured everyone that the target was just the tunnels. Then Hamas killed a bunch of Israeli soldiers in a surprise attack, and Israel retaliated with widespread shelling. This week, the Israeli air force has been hitting 100 to 200 targets a day. How does that fit a campaign against tunnels? The strikes are on suspected weapon storage sites and “homes of terrorists.” Israel keeps moving the goal post, redefining the conditions that would meet its vague objective of “sustainable quiet.” That’s the beginning of mission creep. Where does it end? 5. The payoff is declining. In the early days of the ground invasion, the IDF bragged about all the tunnels it had found. But in the last few days, the rate of discovery has trailed off. To find the rest, Israel would probably have to expand its areas of operation in Gaza, and that means more gunfire, bombing, shelling, and civilian deaths. Israeli soldiers would die, too. On Wednesday, three of them were killed on a tunnel mission. 6. You’re losing too many soldiers. Before the ground invasion, the IDF’s casualty count was zero. Now it’s more than 50. Hamas, which measures success by how many Israelis it kills, is getting the blood it wants. Why give them more? 7. You’re close to losing another Gilad Shalit. The last time Gaza militants captured an Israeli soldier, Israel released more than 1,000 Palestinian prisoners to buy his release. In the last couple of weeks, Hamas has made several attempts to grab another IDF soldier alive. If it gets one, imagine the leverage it will gain. 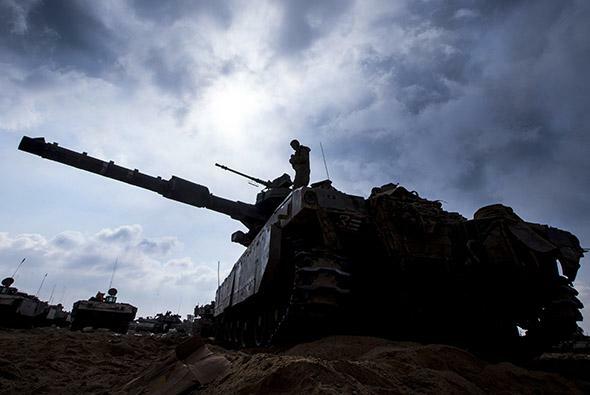 An Israeli soldier prepares a Merkava tank along the border between Israel and Gaza on July 29, 2014. This kind of escalation against anyone who doesn’t affirm all your beliefs, including your friends, is mental illness. In foreign policy, the damage and self-destruction are that much greater. Now Kerry is wondering aloud whether he can take Netanyahu’s stated support for a cease-fire “at face value,” and the U.S. State Department is expressing dismay at the accusations from Israeli ingrates. The department’s spokeswoman says, “It’s simply not the way partners and allies treat each other.” And Israel doesn’t have any other genuine ally. 9. Your eldest statesman says it’s time to stop. A week ago, Shimon Peres stepped down after seven years as Israel’s president. The job is ceremonial, but Peres has stratospheric prestige, having served as prime minister in three different decades. On Wednesday, he visited wounded Israeli soldiers and praised them for fighting Hamas terrorists “who have no respect for human lives.” But he also concluded that the war had “exhausted itself” and “now we have to find a way to stop it.” For this, Israel’s housing minister called Peres’ remarks “unacceptable” and accused him of undermining military morale. 10. Your army hints that it’s time to stop. On Tuesday, an anonymous “high-ranking military official” told Israeli reporters that “the political leadership must decide now—either we push deeper [into Gaza] or we backtrack.” He cautioned that “we won’t be able to take out every tunnel” and added (in a country where polls overwhelmingly favor further prosecution of the war) that “our responsibility is to lead the offensive to where it needs to go, not to where the public wants.” That sounds like a warning that the wise course, at this point, is to get out. They’re using their civilians to protect their missiles. So naturally, they’re responsible for all the civilian deaths that occur accidentally. We’re sorry for any accidental civilian death, but it’s Hamas that bears complete responsibility for such civilian casualties. That’s a fully self-absolving mentality. It pre-emptively removes all blame from the trigger-puller and his government. Some ministers in Netanyahu’s government have gone further, arguing for a cut-off of food, water, and electricity to Gaza. A deputy minister blames Palestinians for their predicament, noting that they elected Hamas eight years ago. Once you’ve devised a moral argument that excuses anything you do, you’re lost. 12. The West Bank is boiling. So far, the war has been confined to Gaza. But Hamas has been doing everything possible to inflame anger in the West Bank. Over the last two weeks, the Palestinian Ma’an News Agency has tracked an increase in “armed attacks on Israeli military sites and settlements in the West Bank.” If Israel doesn’t end one war soon, it may soon be facing two.